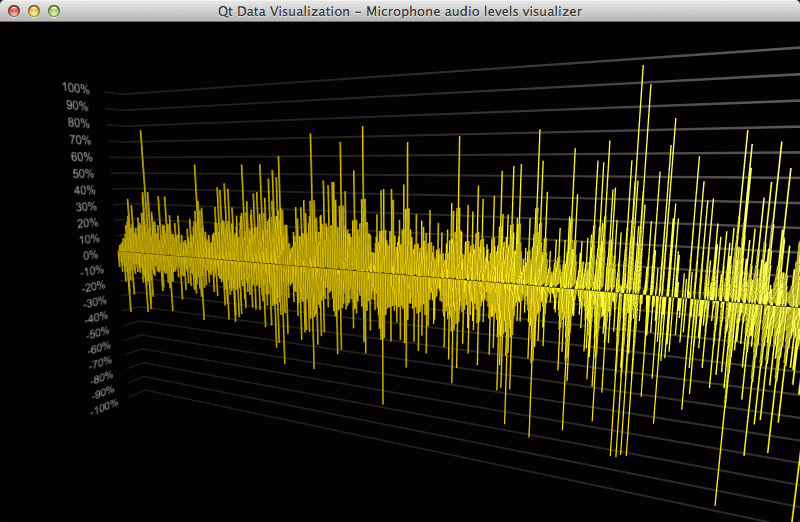 The audiolevels example shows how feed real-time dynamic data to a graph using Q3DBars. This example reads the audio levels from a microphone and displays those levels in a bar graph. To increase the load for demonstration purposes, and to make the graph little fancier, slightly modified data is used to fill multiple rows. The interesting stuff happens in AudioLevels and AudioLevelsIODevice classes, so we concentrate on those and skip explaining the basic Q3DBars functionality - for that see Bars Example. AudioLevelsIODevice subclasses QIODevice and is given as input device for QAudioInput class, so it receives microphone data. The resolution constant indicates the sample rate, for example, value 8 means every eighth byte from audio input is visualized. This is necessary to make the data readable, as it would otherwise make the graph scroll too fast. // The amount of new data available. // If we get more data than array size, we need to adjust the start index for new data. // Move the old data ahead in the rows (only do first half of rows + middle one now). // If the amount of new data was larger than row size, skip copying. // Insert data in reverse order, so that newest data is always at the front of the row. // Add 0.01 to the value to avoid gaps in the graph (i.e. zero height bars). // Insert a fractional value into front half of the rows. // Copy the front half of rows to the back half for symmetry. // Reset the proxy array now that data has been updated to trigger a redraw. We use a couple of techniques here to improve performance. First, we reuse the existing data array, as this allows us to avoid any extra memory allocations in our application code. This also means the data array dimensions do not change, which further improves efficiency in the bar graph renderer. Secondly, since each row is a QVector of bar data items, which do not allocate any data that needs deletion, we can utilize memmove and memcpy functions to quickly move and copy data around. Note: In the future versions of Qt Data Visualization, QBarDataItem might get extended so that it does allocate some memory to store other optional bar properties besides the value. In use cases where those optional properties are used, using memmove and memcpy could lead to memory leaks, so use them with care.